Check out the latest Market Basket Weekly Ad Circular, valid April 14 – April 20, 2019. 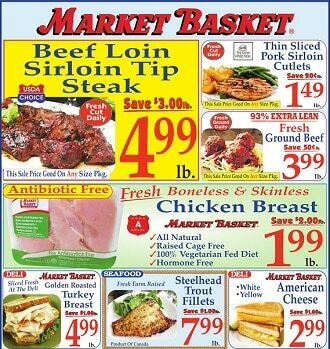 Save with this week Market Basket Flyer Sales and bakery & deli offers & specialties. Find savings and every day low prices for grocery items including Fresh Farm Raised Norwegian Salmon Fillets, Golden Ripe Pineapples, Norwegian Haddock Fillets, Francesco Rinaldi Pasta Sauce, Tide Laundry Detergent, Porterhouse or T-Bone Steak, Fresh Green Peppers, Florida’s Natural Orange Juice, Whole Beef Tenderloin, Starbucks Coffee, Organic Broccoli, USDA Choice Certified Angus Beef Boneless Beef Chuck Steak. Don’t miss this week ad deals and don’t forget to print off your coupons before heading out this week to shop.